have provided a list of the current journals of relevance to anaesthetists. Links to the online journals and subscription pages are provided. If you don't have time to read the journals then access our abstracts page. Each month our team reviews the journals below; selected key papers are then summarised to help keep you up to date without doing the work! 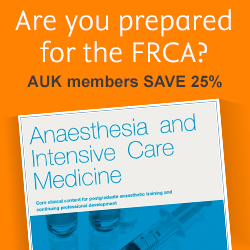 Elsevier’s Anaesthesia and Intensive Care Medicine (AICM) is a continually updated, evidence-based learning resource of core clinical content for postgraduate anaesthetic training and continuing professional development. Led by an eminent international Editorial Board including FRCA examiners and mapped to the curriculum of both the Primary and Final FRCA exams, AICM gives you high calibre and concise articles designed to help you pass the FRCA exams. This resource also provides a compact teaching aid for consultants, regarded as a superb didactic tool to help train junior staff to become safe and competent anaesthetists. All personal subscriptions give you access to over 1,800 articles, with hundreds of self-assessment questions from the ‘Test yourself’ section updated monthly, in addition to 12 print issues mailed to your door. Click here for a free copy of our February 2019 issue, which includes all full-text articles. Anaesthesia is the official journal of the Association of Anaesthetists of Great Britain and Ireland and is international in scope and comprehensive in coverage. It publishes original, peer-reviewed articles on all aspects of general and regional anaesthesia, intensive care and pain therapy, including research on equipment. Review articles up to 10,000 words, special articles, case reports and historical notes are welcome. Also published are editorials, book reviews and obituaries of eminent anaesthetists; there is an active correspondence section in each issue. The Annual Report of Council is published each year. The best content from 2004 is now free to all researchers. Click here to view the article titles and you will be taken to the full-text article, where you can read, search and cite. In 2005 the American Society of Anesthesiologists (ASA) celebrated its 100th Anniversary. The official ASA journal, Anesthesiology, is read by more anesthesiologists throughout the world than any other periodical in the field. Clinicians look to it as the leader for practical information on clinically important advances; academics and research scientists depend on it for detailed reports on frontline research of the highest quality. The journal's diverse, peer-reviewed content includes clinical investigations, case reports, reviews, medical intelligence articles, clinical and laboratory investigations, editorials, correspondence, scientific meeting reports, and book reviews. A supplement containing abstracts of the papers presented at the ASA Annual Meeting is published each September. Founded in 1923, one year after the first anaesthetic journal was published by the International Anaesthesia Research Society, the British Journal of Anaesthesia remains the oldest and largest independent journal of anaesthesia. It became the journal of the newly formed College of Anaesthetists in 1990. The College was granted a Royal Charter in 1992. Although there are educational links between the BJA and the College, the journal retains editorial independence. BJA publishes original articles in all branches of Anaesthesia. Submitted manuscripts are subject to stringent review to ensure that the journal only contains papers of the highest standard. The editions vary only in their advertising content. The Clinical Research and General practice editions include comprehensive Careers supplements aimed at hospitals doctors and general practitioners, respectively. bmj.com—launched in May 1995, the site contains the full text of all articles published in the weekly BMJ since January 1994 as well as material unique to the website. The Canadian Journal of Anesthesia (CJA) was founded in 1954 as the result of the merger of the News Letter and of the Proceedings of the Canadian Anaesthetists’ Society. Dr Roderick Gordon acted as the first Editor-in-Chief and, at that time, the Editorial Board comprised three members. Dr Douglas Craig took over the position in 1983, followed by Dr David Bevan in 1989, who presided over the Journal’s destiny until the year 2000. Since its early days, the CJA has become internationally recognized and now receives over two thirds of its submissions from foreign authors. The CJA has published countless articles of extraordinary quality from its contributors across the world. In recognition of this international perspective and exposure, and to pursue this orientation further, the Board is now appointing a number of corresponding board members world-wide, in addition to the 16 members of the Editorial Board from across Canada. 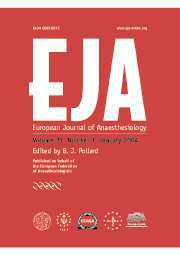 The European Journal of Anaesthesiology publishes original work of high scientific quality with preference given to experimental work or clinical observation in man, and to laboratory work of clinical relevance. Published on behalf of the European Society of Anaesthesiology, by Cambridge University Press. Official journal of the Obstetric Anaesthetists' Association (OAA). Members of the OAA receive the journal as a benefit of their membership. - care of the critically ill obstetric patient. The New England Journal of Medicine is the international forum for medical research and opinion, reporting developments in the forefront of medical progress. The variety of topics covered include advances in research and commentary on the social, ethical, legal and economic aspects of medicine. Emphasis is placed on avoiding terminology understood only by specialists so that published data is accessible and useful to all medical disciplines. The official journal of the International Association for the Study of Pain® (IASP®) and has been published since 1975. 18 issues of Pain per year of original research on the nature, mechanisms, and treatment of pain are published. The journal provides a forum for the dissemination of research in the basic and clinical sciences of multidisciplinary interest. It is a peer-reviewed journal and is cited in Current Contents and Index Medicus.